On May 1st, 2017, hundreds of people filled the City Hall Chamber in Kankakee, IL to witness Chasity Wells-Armstrong, the first African-American Mayor to get sworn into office. During this historical moment, happiness and excitement illuminated the room as the new Mayor took her seat to begin her new role. Prior to Mayor Chasity Wells-Armstrong’s oath, she has served as Alderwoman in the 5th Ward of Kankakee, worked for Kankakee School District #111 and as the Deputy District Director for Democratic Congressmen, Bill Foster, etc. She holds a seat on numerous boards where she strongly impacts the community. Her background includes her earning an Associate’s Degree at Kankakee Community College, and a Bachelor’s and Master’s Degree from Governors State University in social work. She is very active in the community where she has been involved in countless community initiatives. 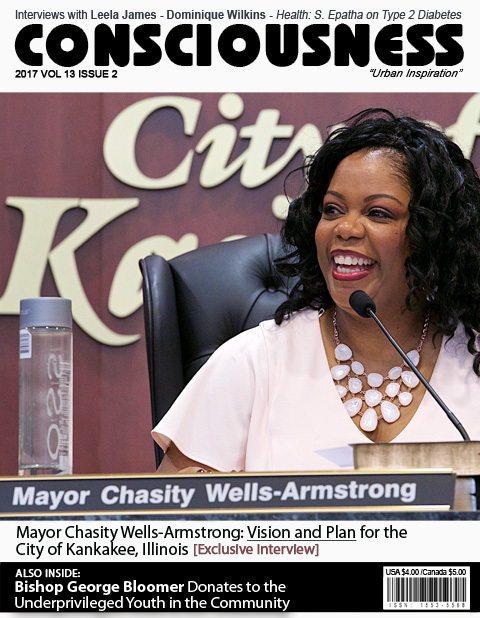 Consciousness Magazine had the privilege to interview Mayor Chasity Wells-Armstrong, a woman filled with love, joy and happiness and who has a genuine passion for making significant changes in the City where she grew up. Here is what she has to share about her vision and plan for the City of Kankakee. 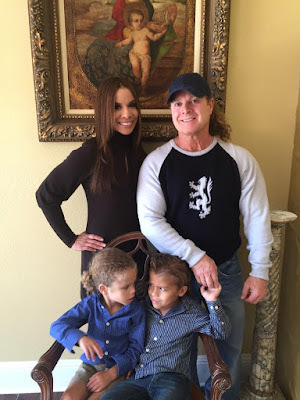 Aaron Robinson: Thank you for taking out the time to pursue this interview with us. We truly appreciate it! Mayor Chasity Wells-Armstrong: No thank you. It’s my pleasure! Aaron Robinson: What is the gratification like being the first African-American Mayor of Kankakee, Illinois? Mayor Chasity: Well, I know that it is a huge milestone for this community. One thing that has been gratifying is seeing how children are engaged. They are excited! My husband and I were talking about how when we were children, we weren’t on the radar with politics the way children are now. I have ten year olds that are excited about me being the Mayor, and they have an understanding of what that is. That lets me know that they are watching and paying attention, and I have an opportunity to help mold them. I’m very excited about that, and that’s gratifying for me. Aaron: When did you realize running for Mayor was something that you wanted to pursue? Mayor Chasity: I served on City Council for two years, and I’m a person that really tries to build relationships with people. As things continued to occur throughout the community, I felt like there weren’t appropriate responses to those things from leadership. At that point I felt like I needed to do something. I don’t believe in just being a complainer, and not being a problem solver. So, that was the point when I started thinking that someone else is going to have to step up. Tocarra Eldridge: What is your vision for the City of Kankakee? More so in regards to making Kankakee an active City, healthy City and engaged City? Mayor Chasity: In terms of my vision, I want to create an environment where people dream, grow and thrive here. I want children to stop growing up here and leaving and not coming back. I want them to have opportunity; I want it to be an inclusive community. I’m seeing as I’m navigating the current structure of the City – people have had their hands on the horns for a very long time – and there are other talented people in the community who do not get an opportunity. I want to open up that circle. I want our community to be a place where people can grow no matter where they come from, no matter what they look like, and no matter their income. Tocarra: We are aware that it takes an entire community to help build a City. Can you elaborate on how citizens of Kankakee can help with the initiative to make your dreams and visions of the City come to reality so that everyone can enjoy a decent and equal quality of life? Mayor Chasity: Absolutely! I encourage people to stay engaged. I need people to stay engaged in the process, to be committed to be educated about issues, and to also be committed to building relationships with leaders. I’m a very participatory leader, so I’m very engaged throughout the community. I want people to ask questions. I’m going to create forums where people can ask questions and get information. If everybody does a little bit it will make the community better. We have to shift the mindset of the “Jesus complex” (laughs); I’m not a savior. (laughs) It takes all of us together to bring about the changes that we want. People are saying that to me, so that’s been helpful for me to hear that as I move forward. Tocarra: Good governance at any level requires the strong support of citizens. To retain support of the citizens, briefly, what values, policies and virtues do you espouse in the City? Mayor Chasity: I’m a social worker; I value all people. I believe all people have value. Sometimes I hear particularly in our community, the African-American community, that some of us are so critical of people in our community. I really believe that there are very few people in the world who are all bad. I believe that everybody has something to offer. Everyone has value. That is something that I will put forth. Hearing the perspectives of people that are different from me is important in regards to policy making. I believe in being equitable in terms of resources. I also believe in social justice – making sure the people have access and support towards what they need so that they can thrive. Tocarra: Concerning your administration, what is the biggest challenge that you foresee yourself facing? Mayor Chasity: I’m in the transition point. One of the things that is challenging now is figuring out the structure of the City. I’ve discovered that we really have no human resources department, which is disturbing. Some of those functions have been assigned to various people throughout the City. I really need to get a grasp of what are all the positions, what are all the functions, and what makes sense for us moving forward as a City. There are some changes that I see that I already want to make. Some people have two and three jobs. You can’t expect someone to be their best self in their role if they’re stressed like that. That is something that is really a focus of mines right now, and also making sure that I am aware of everything that is going on as this transition occurs, and of course the budget. Aaron: In regards to minority owned businesses in the City, although there is a small percentage of minority owned businesses, in these challenging times, what can the City do to help entrepreneurs build their businesses and what effective steps can your administration do to help build minority businesses? Mayor Chasity: One of the things that I think is needed is education. When I grew up as a kid my parents worked at one place for 30 years and then they retired. Young people don’t want to work like that and we have a lot of people in our community who are creative, and I believe we need to foster that creativity. With that being said, to say that you want to be a business owner and open your own business sounds glamorous, but there is a lot that goes into that if you’re going to be a sustainable business. I’m already having conversations with local banks and the Chamber of Commerce about bringing education to that issue. We currently have a program called Enterprise You that is ran thru the Chamber, and that program is a program to help people who want to start a business. They help them develop a business plan. They talk with them about credit. If your credit is not good enough there are banks there to tell you this is what we’re looking for when we loan to a business loaner. They discuss who is your base, as well as the market for your idea. I think a lot of people jump in without considering a long term plan. They max out their credit cards and then do not have anything coming in to sustain. I believe education is very very important. I’m a proponent of education no matter what the issue is. There is also programs through our small business administration, minority programs for businesses, veterans and women. There are resources out there that I am aware of from working at the Federal level, and I will leverage those relationships that I have with members of congress to get those resources to the community. Tocarra: Many college graduates who are natives of Kankakee do not return to the City due to the lack of employment and the high unemployment rate. What plans do you intend to implement to combat this issue? Also, if possible, can you elaborate on a few of the likely job positions that may become available under your administration? Mayor Chasity: In terms of creating an environment where young people will come back, that is going to take some work in terms of economic development. I’m planning to have our community assessed through an organization that I talked about during the forums with the prior Mayor in Economic Development Administration. They are a Federal agency; they come in and access your community. We have a lot of resources in Kankakee, and they can tell us what would make sense in terms of us expanding and what would make sense in terms of us bringing something here. For example, we have two hospitals and we have certain industries here. Is Valspar importing something into the community that they need to run their business? Is that something that we can make here in Kankakee? We need to develop a strategic plan for economic development. We currently do not have a strategic plan. In my second term I plan to start a youth mentorship program. I want to partner with the City Departments and Workforce Investments, placing our youth throughout the City to expose them to different jobs in the City. For example, when I was preparing to run for Mayor, I shadowed the Department of Public Works and rode in the truck for two hours to talk to them about their work, what they do and to get a perspective of their work. I had no idea what an Arborist was. They take care of trees. (laughs) So, for a young person that says I don’t want to go to college Mayor, I want a job working outside, I want to work with my hands – I want to create a program in the City for our youth where they can be placed throughout different departments…clerical, etc. Our Waste Water Treatment Plant entry level positions are $70,000 per year. They don’t require college, but people don’t know that. We don’t do a very good job in communicating. My thing is, if you aren’t exposed to it and you can’t see it, you don’t know that you can do it. I really want to open that up to our youth. Then the partnership piece comes in soft skills. A lot of our employers complain that our youth don’t have soft skills…they’re late, they dress inappropriately, they’re doing things on the weekend that impact their ability to perform on Monday. I want to make sure they understand a work ethic and what a good work ethic looks like. Tocarra: In the past, there seemed to be fewer leaders in the community having a great concern for our youth and young adults. There are many parks, several community centers and recreational places; however the young people seem to be less interested. Are there any plans being implemented for the youth and young adults encouraging them to stay active and remain out of trouble so that they can feel connected and remain rooted to the City? Mayor Chasity: One of the things will be the mentorship program that I’ve talked about. Our Park District is in disarray. I don’t have particular jurisdiction over the park district. A lot of people don’t understand that. We certainly impact each other and work hand in hand, but I can’t fire people in the Park district. They are a separate body of government. They levy their own taxes. We own the Martin Luther King Park, but most of the parks are owned by the park district. With that being said, I would like to introduce a Kankakee Forward Initiative that will target youth and have them engaged in their government, and knowing why it is relevant and how it affects them, all the while training them to be leaders. There will be some other things coming, and we’re discussing that now while we’re in transition. Aaron: Crime has been consistently mentioned throughout the City as one of the biggest problems. What can your administration do to help and repair the problem, as well as improve the City’s public perception? Mayor Chasity: You probably already know the Chief of police resigned the day after the election. I think a critical piece for me is getting the right people in the right positions. We need a police chief that is going to reflect things that I value in my administration like respect and being culturally sensitive. People of color are raised very different than Anglo people. I’m seeing some disturbing things and I’ve had conversations with our States Attorney about it. The way I was disciplined as a child can now be a criminal offense. (laughs) Parents are struggling with that. In terms of crime I think it’s getting the right police chief, because the Mayor is the ambassador of the City and the Mayor is going to set the tone for the City and the police chief is going to set the tone and culture for our police department. If our chief is engaged, compassionate and respectful of the community, building relationships with our community – I believe in community policing – I believe that is going to improve our relationships. We have to partner in fighting crime, because if we don’t the issue is not going to go away. Right now my understanding is there is a disconnection between the police and the community. That’s very problematic, because when crime happens people don’t talk to the police. What I have found out, which is very disturbing to me, is that we can’t event have this conversation with the police because nobody wants to acknowledge that there has been this history and this dynamic between communities of color and the police. They almost get offended when we bring it up and start telling us about an accreditation they have. I explain to them, my husband and I are upstanding citizens and if we get pulled over we don’t have drugs or weapons in our car, but we still get nervous about it because there has been a dynamic. We don’t think when we get pulled over oh the City of Kankakee has an accreditation. That’s not what’s going through a person of color’s mind. We should be having regular conversations with the police. We should not just see police when there is a tragedy or when something traumatic has happened. Tocarra: The prior administration was not very helpful to all ethnicities, however more so invested interest in particular individuals. What are your thoughts on the outlook, inspiration and shift of power for the individuals who did not have support from the prior administration? Mayor Chasity: I’m inclusive and I’m going to give people an opportunity. I know there is a segment of the community that is very upset because when you benefit from a system and a structure you don’t want it to change. People naturally fear change. I am going to work very hard to be fair. I’m opening that circle up to the community. I believe that, and that is how I will run my administration. Aaron: In the past, the Kankakee City sticker requirement was eliminated. However, under past administration, the City sticker was re-implemented. There has been a massive amount of complaints from citizens regarding this being a financial burden. What are your thoughts on this? Mayor Chasity: I’ve heard people complain about it, but the reality is that it’s not going to be eliminated right away. My goal would be, as we build our economic base by recruiting businesses, getting homes again, that we would be able to decrease that. I can’t go in day one and say we’re not going to have a sticker. It generates approximately $475,000 of revenue, so I’m already looking at coming in and adding positions to hire people that need to be hired. I am not going to lie and say that it’s going to be eliminated. I will work very hard to incrementally reduce that, but unfortunately right now we are in a position where we need the revenue. Also, we need to be responsible as residents because we all know it’s coming up in June. (laughs) Just like Christmas comes every 25th of December (laughs), and Mother’s Day comes every May. (laughs) So we need to quit acting like we’re surprised and be personally responsible and budget our $35 for our vehicle. I’m a keep it real Mayor. Tocarra: In the past there have been several prime time talk shows that have stated a multitude of negative comments concerning the City of Kankakee. What plans do you have economically, socially and politically to reverse that stigma and potentially make Kankakee outstanding? Mayor Chasity: I think this election alone has brought a lot of positive press to Kankakee. The other thing that we don’t have for the City is someone that does PR/Communications for the City. One of the things that I talked about during the forums against the other Mayor was our website. It’s embarrassing; it’s ridiculous. It does not highlight any of the resources we have. It does not reflect who we are. It doesn’t market our resources, our industries or our strengths. We have to take responsibility for telling our stories. We have a lot of wonderful people in Kankakee with good things going on and you only hear about the negative things. We have to take responsibility in putting that information out. We need someone who is going to be able to do PR and Communications. Just with the election alone we’ve gotten so much positive press for me being the first African-American. It was in the Huffington Post, and our race was mentioned. You guys are now doing an interview and there are some other things in the pipelines. Tyjuan Hagler has his basketball tournament in Kankakee. He grew up here and he played pro football. We have to do a better job and take responsibility for that and see that it is a valuable piece of government of telling our stories. Aaron: For those elders who stay at home and feel as though there is nothing in public for them to come out to and participate in, will there be any plans implemented for them to come out and use there knowledge and wisdom to give back to the community? Mayor Chasity: I think a lot of people have a misconception that there is nothing to do. There are a lot of things to do in Kankakee. I think the problem is that we don’t always communicate that well. Certain sections of government and even organizations operate in silos. One of the things that I’m hoping to do is streamline that once we revise our website so people know what’s going on, have a community calendar, etc. I believe in engaging all generations and as many stakeholders as I can so I’ll be forming some advisory committees to the Mayor – for youth, business owners and for elders. I always seek the wisdom of people who have served before me. I don’t want people to feel irrelevant and forgotten because they’ve gotten older. I visit the churches regularly and I will continue to do that. I want them to know that they are valuable and to stay engaged. Aaron: You now uphold a stronger position being a role-model and inspiration to many. Do you have any inspiration or words-of-encouragement for young females and males also going through trying times, however having challenging times remaining focused, positive, and believing in themselves? Mayor Chasity: I talked about this a little bit during the campaign. A lot of people look at me now and don’t know – I don’t look like what I’ve been thru. My dad is a Vietnam veteran and went into the service at 17 years old and had a lot of trauma…grew up in poverty. I’m the oldest of 5 children, and there was some impacts from that. My senior year in high school I stopped going to school. I dropped out. However, I was still able to graduate on time, because I’m a nerd. (laughs) I really like to learn, so I had taken all these early and late bird classes. I love school. School was an escape for me; being in the books was an escape for me. A lot of people don’t know that. They don’t know I dropped out of school, that I got pregnant at 18, was homeless – I never talked about that – was once living in a car at one point before I met my husband. You can overcome anything. I think for most people it’s having some source of faith, whatever they believe that is for themselves. Reach out to someone that you trust, someone that you can talk to about things that are troubling you and they can give you some guidance. I’ve had people in this community that have done that for me. I met Alderman Brown being a runaway, and I set behind him on the City Council [as an Alderwoman]. Now, my life has just come full circle with that. 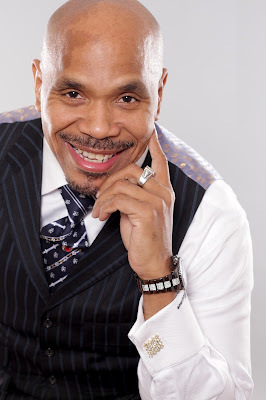 Pastor Tyler Prude at Second Baptist Church was another person that encouraged me and helped me get into college when I was having a lot of challenges. It just takes one person that can encourage and plant that seed and help that seed grow. I’m proof of that. A lot of times our kids just need support and many people are just so negative and so doubtful. I’ve accomplished a lot. I have a Master’s degree, I’m a Certified Addictions Counselor, and even during the campaign I had people minimizing my credentials and experience. People act like I’ve only been an Alderwoman for 2 years and I’ve never done anything else in my life. Like I just started working at 45 years old; (laughs) I’m 47 now. My parents raised me – as a person of color and as a woman, you’re going to have to work twice as hard. Our young people need to understand that. They have to get a work ethic. It’s not fair, but it’s the world we live in. When most people see you’re trying to work towards something to help yourself, someone will help you. Nobody owes you, but you have to have a work ethic. You don’t even have to be the smartest person, but if you have a work ethic, that will carry you so far. Aaron: Mayor Chasity, before we end the interview, would you like to add anything in closing? Mayor Chasity: I just want to thank you guys for interviewing me! It’s an honor for people to be interested in your story, and want to hear your story and share your story. I want to encourage you guys to stay engaged. I want to encourage our community. I want them to be hopeful. I think that’s one of the greatest things that I’m seeing right now, people have hope, especially young Black men. I’ve had barbers and other young Black men that are reaching out to me now because they feel like number one, I understand their struggle, which I do, but not to the point to what they have went through because I’m not a Black man, but I understand the struggle; and number two, they know that I’m somebody who cares and is going to work hard and is committed to making opportunities for everyone. I do need everybody to do their part. If we all just do something, as parents we have to go to our parent teacher’s conferences, we have to watch what we’re doing around our kids. Whatever you’re passionate about, I encourage everyone to get involved in the community in some way. I’m going to be promoting opportunities for that as well out of the Mayor’s office. Thank you guys! Order your print edition of Mayor Chasity Wells-Armstrong featured in Consciousness Magazine.